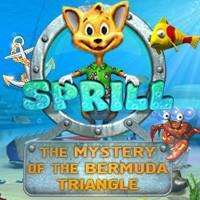 Sprill the fox was sunbathing in his boat while sailing through the Bermuda triangle, when he was abducted by aliens from the planet Akvtar. They force him to search for the Poseidon pearl, an ancient artifact vital for the survival of their planet, among the debris of sunken ships. This is a hidden object game with logic puzzles between each chapter. The objective is to find and click on all the items from a list at the right side of the screen, on locations filled with scattered objects, within a time limit. The puzzles take place on a separate screen and are mechanical in nature, where the player has to interact directly with devices on the scenery to gain access to an object and move on with the game. Objects can be dragged and dropped, buttons can be pushed, chains can be pulled and so on. There are no instructions, but the player can use the hints to skip one of the necessary actions, incurring a time penalty. Hints are stored as question marks at the top of the list, and when used they show the exact position of one of the required objects. Extra hints can be found and collected as hidden question marks on the scenery.